Since the start of our Ministry of Education, Culture, Sports, Science and Technology Global COE (Center of Excellence) Program “Digital Humanities Center for Japanese Arts and Cultures” at Ritsumeikan University in June 2007, we have been conducting education and research, aiming at creating a new type of the humanities that fully utilize information technologies so that we could bridge the gap between Japanese Studies in Japan and abroad, as well as lead the humanities in the future. 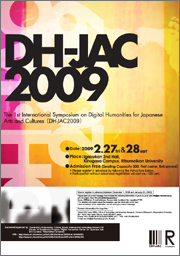 Welcoming distinguished scholars in various fields of digital humanities from all over the world as guest speakers, we sincerely hope that our 1st International Symposium on Digital Humanities for Japanese Arts and Cultures (DH-JAC2009) will provide us with a great opportunity not only to look back and reflect on our activities in the past two years, but also to find a path to take for the future of the Center. Please join us on this important occasion. -Admission (Seating Capacity 300; First come, first served): Admission is free if you register in advance by following the instructions below. *Participation without advanced registration will cost you 1000 yen is also free. -Do you wish to attend the reception? Y/N *For detailed information about the reception, see below. Upon completion of the registration, we will send you a return message. After the completion of the first day’s program, we will have a reception for all the guests and participants of the Symposium. Reception fee: 2000 yen for non-student participants; and 1000 yen for students (please bring your Student ID). ※ Please pay your reception fee at the entrance of the restaurant Tawawa-Nijo. ※ As the restaurant has no parking space available for cars and bicycles, please use public transportation to attend the reception.